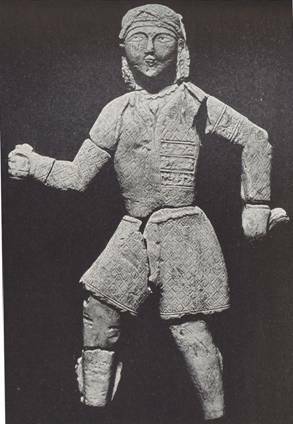 The finding of a photo of one of the stucco figures is what started me on this quest for information about the Seljuki. See Figure 1. When I first saw this stucco carving (figure 1), I assumed that the label was incorrect. I thought that it was a woman not a man. I had never seen a feathered headdress with the three prominent feathers except in female headdresses. 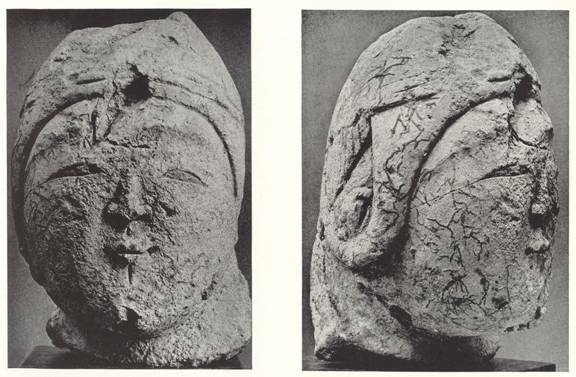 Now, these were later than the stucco carving, but I had only found them on women’s headdresses. This is my attempt to start this research; I feel that it is a project that will be continuing for a long time. 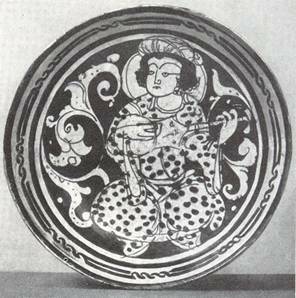 As usual in Islamic art, we find more illustrations of males than females. Most of this is cultural, in the Middle/Near East especially in Islamic countries, women are encouraged to not put themselves forward or to be hidden away from others not of their family. In times of invasion this was probably even more so. item on the whole costume for time placement is the fact, that unless it is a garment for lower body, it has a ‘Tiraz’ band of some type. Tiraz bands can represent a gift of fabric from the current ruler, a blessing or just a decorative band at the bicep of the arm. A lot of the surviving examples do have writing on them. 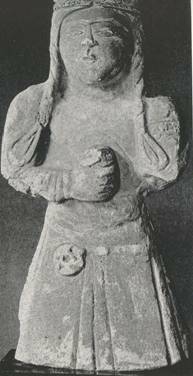 The Stucco figures do have Tiraz on the arms but the writing can not be translated according to the article. 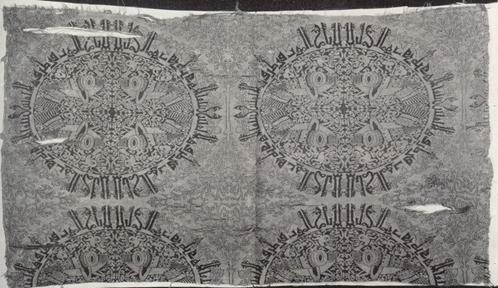 In studying other art work, I find a multitude of different designs – Knot work, geometrics as well as stylized writing. The younger or more active man is usually shown in variations of the basic dress. Usually his main garment, wherether it is a loose coat or one of the tunic coats, in length it falls just below the knee or mid-calf. It has long sleeves and opens down the center front. His boots comes to approximately the same point. 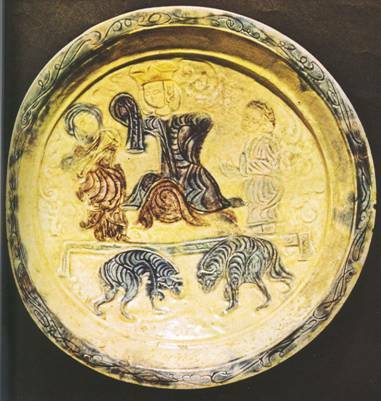 I have not found a piece of art work from Persia that shows the outer pants. I can only surmise that they are present, since they are shown occasionally in art work from Egypt a little later. We do have a couple of pieces that show the underwear pants. They show a loose fitting light colored (most likely white linen) pant anywhere from just below the knee to ankle length. You will see a couple of different hats with the shorter coat. A cap with a turned up brim (think of a baseball cap with the brim flipped up) usually edged in black (most likely silk). A Pillbox shaped hat, some times decorated with feathers or a frill in front. And a wide band decorated in front and worn with a short veil. The hair is worn long, sometimes with the front braided with loops at the bottom. 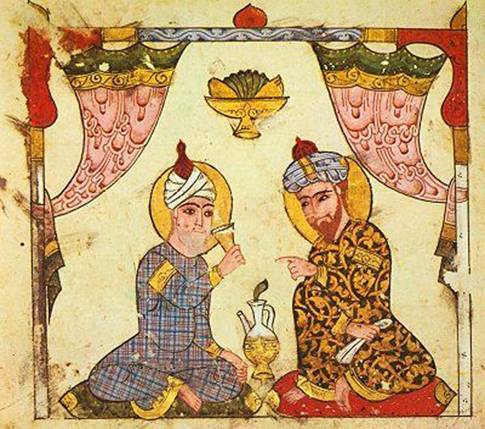 The older or more scholarly are usually shown in a long robe and turban. I feel this more in line with a caftan or long Tunic in cut. No openings show in the art work, this may be artist convention though. I feel that there had to be some kind of opening at the neck at least, since the art work show a high neckline. This is always shown with a turban and usually with a full beard. Some times a stole of some type draped around the body. 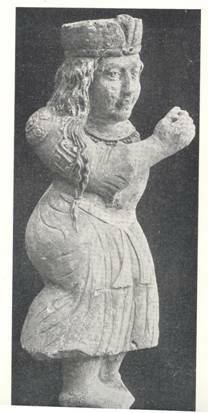 From what I can find the woman’s costume in the Seljuki culture was a long loose gown with long trumpet shaped sleeves Triaz bands are apparent on the sleeves which could have had extra length (according to one dish showing a dancer Figure 13). Jewelry is apparent in the art works, necklaces and earrings. One question that I have been asked is where ever the Sljuki ladies ever wore the decorated loose coat and my answer is that I do not know for sure. 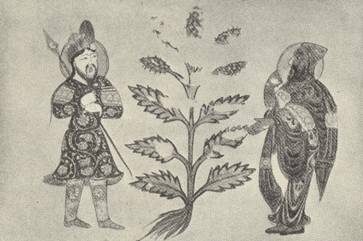 But…… I do think that they did wear a garment similar to it given the climate in areas of Persia . The main problem is that none of the art work I have seen shows any thing similar. Most ladies are shown wearing a hat and most likely a veil. The hats seem to follow the same patterns as the men (cap with turned up brim and pillbox). 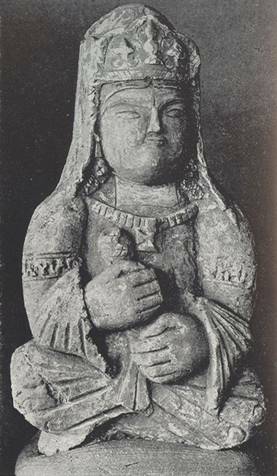 One of the stuccos figures shows a hairstyle that according to art works continued on for about 200 hundred years. 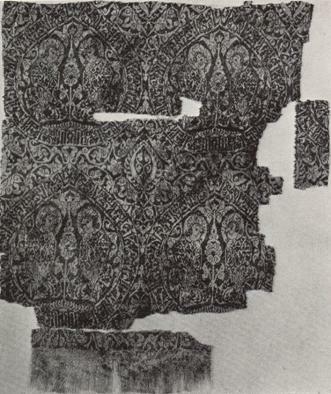 Here are a few actual fabrics from the Seljuki culture. 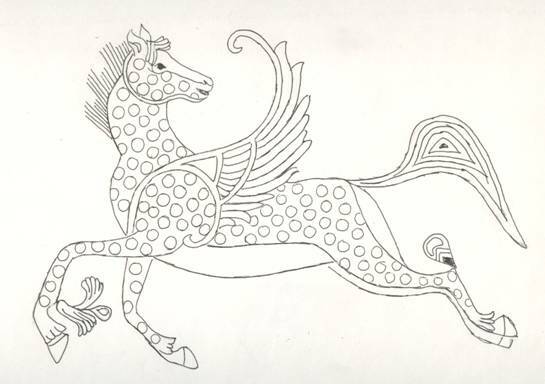 These are all from Masterpieces of Persian Art and are mainly compound cloth of Silk. Most of the patterns are high contrast. 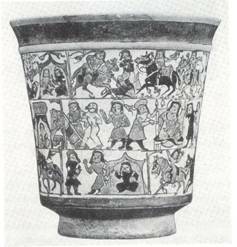 Colors almost seem to have been copied from ceramics. My patterns are line drawing of the basic cut of the garments, they are supposition. My method of patterning is not fool proof. They are based on rectangular construction methods. The key hole neckline is another option but the only neckline I have been able to document is the square. Most of the art work does not show the necklines on ladies very clearly to be sure of other styles. The Mongol conquest of the 13th century affected more than just the areas that they conquered directly. The push of the invaders caused many to abandon the land of their birth and move westward. But we are indebted to this invasion, because by abandoning their home and moving to Egypt and the other Islamic nations further west, the Seljuk culture change and grew. The Mukluk’s of Egypt and Andalusia of Spain are direct ancestors of Seljuk’s of Persia . Figure 3 A Survey of Persian Art, Twill shirt with Triaz bands, from the Textile Museum in DC. Figure 15 My sketch of the Stucco head above.